It was a rookie season that was historic, and yet nobody talks about Alex Henery and the Eagles' kicking game these days. Isn't that the ultimate compliment for Henery, the second-year placekicker? All Henery did was make 24 of his 27 field goal chances, missing only a 63-yarder at the end of the first half in Atlanta and two chippie-kicks in the agonizing loss to San Francisco at Lincoln Financial Field. In one fell swoop, so to speak, Henery eased all concerns about a kicking game that had for a decade been handled at a Pro Bowl level by David Akers, the greatest kicker in franchise history. The Eagles invested a fourth-round draft pick in Henery, a standout at Nebraska, and allowed Akers to test free agency and ultimately sign with the 49ers. There, Akers had a brilliant 2011 season and reached the Pro Bowl and nearly the Super Bowl. 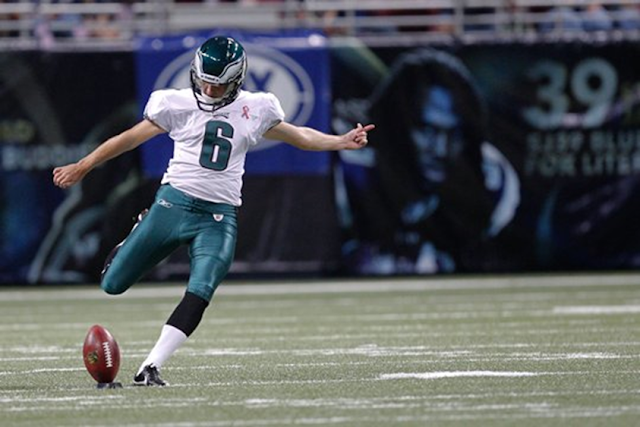 Here, Henery started the next generation of great kicking for the Eagles. Consider that a win-win for all concerned. "I didn't think about David or any of that other stuff when I came here. I didn't know what to expect. I was thrown into a situation and just went with it. There wasn't time to think about it. I was just focused on my job and I guess pretty happy with the way things went, especially the way I finished the season," said Henery. "Every kick you go out there and your job is to make it. I felt like I maintained my strength and actually got stronger through the year." Henery's misses are etched in his mind. In Atlanta, he thought he hit it well and because it was a lower trajectory, the kick was tipped and fell short. Against the 49ers, Henery missed from 39 yards and then 33 yards, pushing both kicks wide right. "The two I missed, I didn't follow through and I just sliced the ball," said Henery. "It happens. I wasn't happy at all, so I had a correction to make and I made it." The Eagles thought Henery was special enough at Nebraska to use a fourth-round pick on him, a stunning move at the time. They added kickoff duties to his list of job responsibilities, and Henery did a great job in that department. As for field goals, Henery made his last 13 kicks after the misses against the 49ers. Now Henery is on to his second NFL season. The Eagles didn't add a kicker for competition, a clear sign that they have complete trust in him in his sophomore campaign. The team may add a leg later just to give Henery a breather in training camp, but he is the guy 100 percent. The Eagles believe they have something special in Henery, who has a big leg and a flatline-demeanor that is perfect for the pressure of the job. Henery says he was "50/50" on kickoffs last year, and he is striving for more consistency in that phase of his game. He also wants to be as automatic as possible from 55 yards and in on field goals and extend his range to 60-plus yards. "I know what's going on and what to expect and that's a good thing," said Henery about being in his second season. "It's kind of more relaxed and I'm able to work more on my game instead of spending time thinking about other things. It's gone well." Henery is an avid golfer, an 8-handicap and he recently shot a 73 at Blue Heron Pines in South Jersey. It's no surprise that he is a steady hand on the links, as much as he is lining up for a pressure field goal with Jon Dorenbos snapping to holder Chas Henry. The Eagles overhauled their kicking game last offseason, a bold and daring move lost in the shuffle of the free-agency spree that dominated the headlines. A generation of excellence from Akers was suddenly a gigantic question, and Henery provided the resounding answer of confidence. If you have been an Eagles fan long enough to cheer the team prior to the Akers years, you know how shaky the kicking game here was. You know about all the ups and downs of the special teams. Henery looks like the next great one, an incredibly visionary move by Howie Roseman and Andy Reid in the 2011 draft. Without skipping a beat, the Eagles have themselves another fantastic placekicker. "I don't look at things other than just making sure I go out every day and focus on my job," he said. "There isn't anything really in my life that makes me lose my cool, I guess. I probably lose it more on the golf course than in football. This is my job and so I go out there and know what I have to do. I have to make kicks. I just go out and do it." It sounds so simple, but it's not. The Eagles have themselves a good one in Henery, and potentially a great one if he continues to stay in his groove, hone his timing and build his strength. There is not an ounce of waver in Henery's personality. He's married. He's a solid guy. He's a humble young man. He loves being an Eagle. And he's on his way to terrific things, even if nobody talks much about him. The truth is, the lack of chatter is the highest form of flattery for a kicker who one year ago was replacing a legend. Now Henery is on his own path, and is off to an historic start.